So, what actually is a family office and are they all the same or, if not, how are they different? To answer these questions, I attempt to come up with a systematic classification. The following types are textbook ideals and in reality the boundaries are more fluent. Also, in reality the types are not all mutually exclusive so that a family office can be manifest itself as a blend of more than one type. Before I attempt to identify the different types of family offices, it will be helpful to define the term “family office”. Simply put, a family office serves as an office to one or more families. In many cases family offices are organized as a separate legal entity but that does not necessarily need to be the case. Historically, many family offices were set up in the finance department of a family business and simply occupied a desk from which the work was done by a staff member of the finance department. Family offices are typically focused on wealth management activities (although that does not have to be the case in my view) and as such will provide a more holistic approach than a typical wealth manager. In addition a family office may or may not provide services such as family governance, philanthropy management, education management, lifestyle or household management, etc. I have found four main types of family offices. Two of them, namely the single and multi family office are well established categories in the industry while the other two are relatively recent characterisations, with the virtual family office being more established than the micro family office. 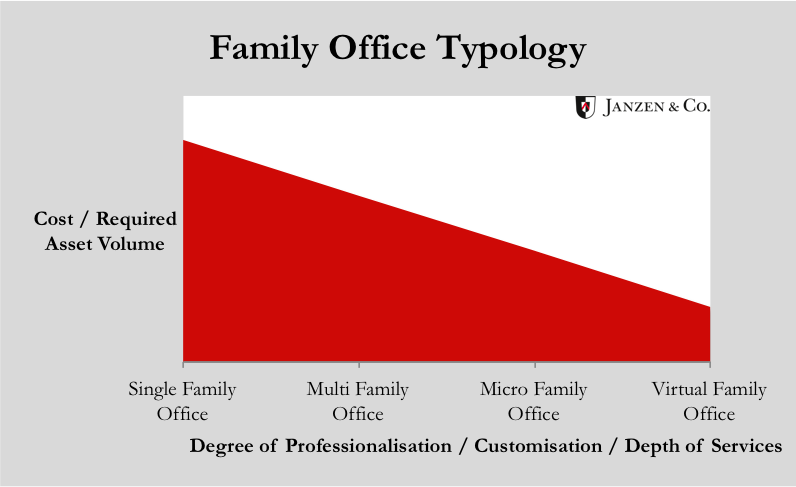 Furthermore, the degree of autonomy of a family office may be a characteristic to include in a typology. Some offices are self-sufficient and need little oversight and direction and are running like a smooth machine while others would simply not work without the active involvement and management of the founder(s). I have, however, neglected the aspect of autonomy for the purposes of classification. The single-family-office is the archetypal form of the family office. It only serves one single family and does not accept external management mandates. As such it is also the ultimate form of a family office as it allows full customization and, in its ideal form, deepest level of services and know how. However, it is at the same time probably the most demanding in terms of organization and management and, as a result, also the most expensive form of a family office. Hence, it is the domain of the ultra high net worth individuals and families. The multi family office type of family office serves more than one family and, depending on the number of clients, can hence only allow a limited degree of customization. On the other hand, joining a multi family office is more affordable and is a viable option with much less net worth than the ideal form of a fully-fledged single family office. A micro family office can take the form of a single- or multi-family-office but is characterised by the volume under management being much smaller than what would normally considered a minimum threshold to set up a family office. This is often achieved by compromising on skill levels of staff or by limiting the scope of activities or investment sectors covered. Also, micro-family-offices often outsource some capacities and functions that would be kept in-house by a fully fledged family office. Often, micro-family offices do not view themselves to be in the category of family offices at all. A virtual family office is characterised by the degree of outsourced functions. A virtual family office may have no or only a very limited number of full time staff with the rest of the required skill being contracted from a trusted group of individual advisors and managers on a part time or retained basis. There may be no real physical office location and communication could be mostly be modern media. Most virtual family offices will be micro family offices but not necessarily the other way around. A virtual family office could also take the form of either a single- or multi-family office. The development of the first family offices in the modern sense of the word, began with the archetypical single-family office. The next step to follow was the multi-family office while the micro- and virtual family offices are relatively new appearances and are, to an extent, driven by technology developments that simply make it easier and more cost efficient to set up a family office structure. With technological advances gathering pace, we expect this trend to continue and accelerate. The democratisation of the family office is in full swing – when will you set up or join your family office? Do any of the types resonate with your situation? What are your experiences with the different types? Have you found additional types in real life? Let me know your thoughts and, if you liked this article, please share it with others.